This issue of the Advanced Aquarist is, in terms of content, somewhat different from what our readers have been accustomed to. Typically we offer a Feature with a series of columns. This issue is atypical because we are presenting three Features and only a few columns. Richard Harker’s three part series, Is it really in the water? A critical reexamination of toxic metals, part 3 brings to a conclusion his final thoughts on the whole issue of metal toxicity first brought before the reef keeping public by Ron Shimek. 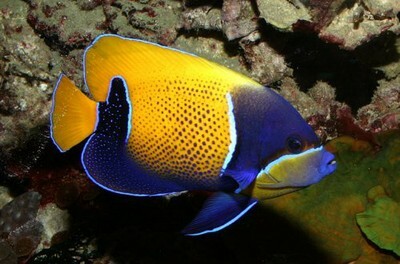 A recent photo of the editor’s majestic angelfish who, over the last ten or more years, has grown to maturity in his reef tank. One of the most often discussed topics by reef keepers is the transmission of photons from the aquarist’s lighting devices to the photosynthetic organisms kept in our closed system reef aquaria. What light spectrum, what intensity, what reflectors best focus that light, and what light source produces the most pleasing effect to the aquarist’s eye are subjects that are of supreme importance to aquarists. No two people in our hobby have shed more light on this subject than Sanjay Joshi, Ph.D., and his colleague Timothy Marks. So that new material from them is not kept from the public any longer than necessary, in this issue we offer two new Features by them: Spectral Analysis of 400W Lamps: XM, Radium, Osram and Sunmaster, PFO, and SPECTRAL ANALYSIS OF 250W DOUBLE ENDED 10,000K METAL HALIDE LAMPS AND BALLASTS. Our hobby owes a great debt to Sanjay and his colleagues, who have brought the discipline of science to a major concern in our hobby that was, before theirresearch, clouded by too much smoke from almost everyone’s opinion pipe. Thanks to them reef keepers can make informed choices about what lights to utilize. In this issue also, Terry Bartelme offers part 4 of his series on Cryptocaryon irritans, what the pathogen is and how to eliminate it from closed system aquaria. I don’t know of an aquarist who has not have had to battle what is known as saltwater Ich, and Terry is doing a great service for aquarists by separating fact from fiction, and useful from snake oil remedies.